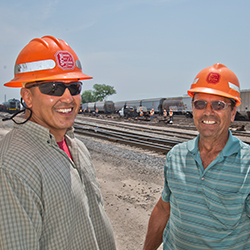 Kansas City Southern recognizes its environmental responsibilities as a corporate citizen. We work to achieve high standards in fuel efficiency and in reduce, re-use and recycle programs. Additionally, we have aligned ourselves with a number of organizations established to help ensure a cleaner environment and public safety. A Responsible Care® partner company since 1999, Kansas City Southern has received Responsible Care® Management System certification in the U.S. by formalizing its Health, Safety, Security and Environmental Management System. In 2002, the American Chemistry Council adopted the management system approach for implementing Responsible Care® in the U.S., including mandatory, independent, third-party certification. In the U.S., KCS is a partner in SmartWaySM Transport, an innovative collaboration between the U.S. Environmental Protection Agency and the freight sector. The program is designed to improve energy efficiency, reduce greenhouse gas and air-pollutant emissions, and improve energy security. The Transportation Community Awareness and Emergency Response (TRANSCAER®) program is a community outreach program designed to address community concerns regarding the transportation of hazardous materials through planning and cooperation. As a community service, KCS hosts events for emergency responders, providing instruction on the safe transportation of hazardous materials and emergency procedures.